"This has been a family favorite for many years. 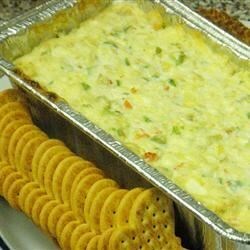 Serve this dip with crackers. It can be served hot or cold." In a double boiler, melt cream cheese with mayonnaise. Stir in white wine. Mix in crab meat, mustard, seasoning salt, garlic powder, onion powder, and Worcestershire sauce. Heat until entire mixture in warm, stirring occasionally. Thin the mixture with more white wine if you would like your dip's consistency to be thinner. I made the dip without the wine and used OldBay instead of the salt. It turned out great. Nice and creamy. It could have used some onions or horseraddish to give it a little more kick. This was good. I think next time I will add some minced onion to it though, it just seemed to be lacking something. Been making this for several years. It doesn't even have time to cool down before it is gone!